Florida Freshwater Nonnative Fish - Southern Tackleworks - Live Bait, Freshwater & Inshore Fishing Southern Tackleworks is Lake County Florida's premier fishing retailer. Located in Tavares, Florida right on the Harris Chain of Lakes, we not only provide the best in rods, reels, live bait, lures, but also fishing advice and repair services. As part of the National Invasive Species Awareness Week (Feb. 23 through 28, 2015), the Florida Fish and Wildlife Conservation Commission is partnering with the U.S. Geological Survey, U.S. Fish and Wildlife Service, National Park Service, Everglades National Park, Florida Invasive Species Partnership, University of Georgia and Everglades Cooperative Invasive Species Management Area to host the first statewide Nonnative Fish Catch, Click and Submit Contest Feb. 21 through March 1, 2015! 1)	Document the distribution of nonnative fish in Florida using angler-caught fish that are photographed and reported to the FWC through thewww.EDDMaps.org reporting system. 2)	Increase public awareness of the potential negative impacts of releasing nonnative fish into Florida waters. 3)	Encourage anglers to target nonnative species for consumption. Registration: All anglers must register with www.EDDMaps.org to submit photographs and catch data. 2015 Nonnative Fish Catch, Click and Submit Contest Start/Stop: The 2015 Nonnative Fish Catch, Click and Submit Contest begins at 6 a.m. Saturday, Feb. 21, 2015, and all entries must be received by midnight Sunday, March 1, 2015. All submissions must be of fish caught during the contest period. If a fish is caught that cannot be identified, please take pictures, submit the catch in EDDMaps and freeze the fish if possible. 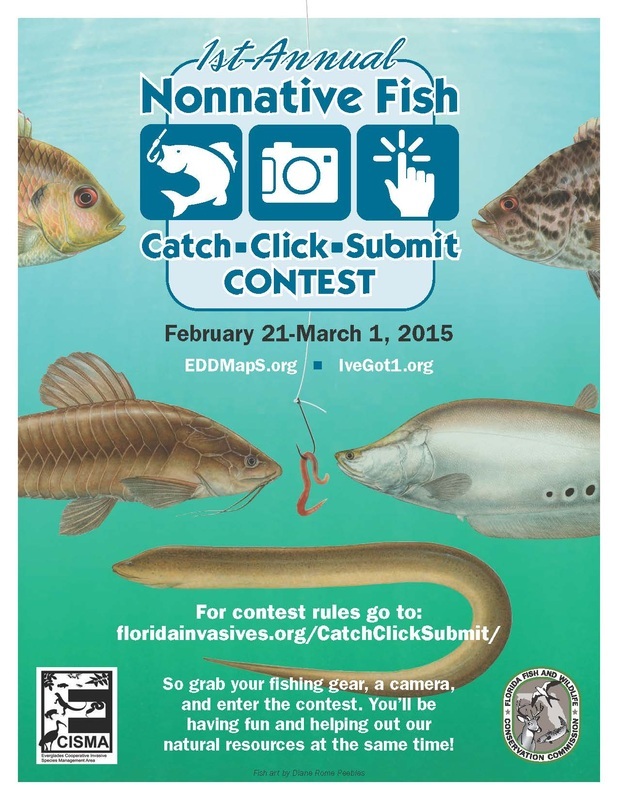 Qualifying Submissions: All EDDMapS submissions, to be considered, must be complete with catch location, picture(s), and a statement indicating the submission is for the Nonnative Fish Catch, Click and Submit Contest. Detailed catch location or GPS coordinates are preferred. Anglers under 16 years in age should indicate that on their entries to be eligible for youth contest. An EDDMaps submission may contain photographs of multiple species if all species are caught at the same location. If nonnative fish are caught at multiple locations, then an EDDMaps submission must be made for each location. Photo Recommendations: Take the fish out of water and, for most species, lay it flat on its side with the head pointed to the left on a light-colored background, preferably in the shade to reduce glare, and extend the fins as much as possible. If possible, include a ruler in the photo or provide a length in the report. For nonnative catfish, take a side-shot with dorsal fin extended and a photo of the belly showing the markings. Boundaries: The boundaries are all legal freshwater fishing areas in the state of Florida. Prizes: Prizes will be announced on March 28, 2015. All participants have a chance to win a Garmin eTrex 20 GPS and other non-cash prizes. Non-cash prizes include merchandise and promotional items with a total value up to $10. State and Federal Regulations: All fish must be caught in compliance with all state of Florida regulations (seewww.myfwc.com/fishing/freshwater/regulations/ or obtain a copy of the regulations at a local bait and tackle shop) and only within legal fishing areas. We encourage anglers to report butterfly peacock bass and grass carp. Butterfly peacock are considered a sportfish and are protected by size and bag limits; all grass carp must be immediately released. Native fish are not eligible for consideration. Members of the Miccosukee and Seminole Tribes of Indians of Florida may harvest nonnative fish with traditional methods. Waiver disclaimer: It is expressly understood that participants in the 2015 Nonnative Fish Catch, Click and Submit Contest enter at their own risk and that Everglades Cooperative Invasive Species Management Area and all participating organizations, officers, event sponsors and committees, and all other persons connected directly or indirectly with the operation of said event, shall be exempt from any liability for libel, slander, loss, damage, negligence, harm, injury or death suffered by any participant, entrant, vessel, equipment, companions and guests, boat captains, mates, or crew members, which may occur in conjunction with the 2015 Nonnative Fish Catch, Click and Submit Contest. Participants: Any and all participants entering the 2015 Nonnative Fish Catch, Click and Submit Contest agree that all decisions made by the 2015 Nonnative Fish Catch, Click and Submit Contest committee/rules committee shall be final and binding in any manner requiring their action. The 1st Annual Statewide Nonnative Fish Catch, Click and Submit Contest is being held during the National Invasive Species Awareness Week, February 22-28, 2015. However, submissions of non-native fish (or other non-native species) can be made anytime throughEDDMapS.